Yesterday the #AISQ8 elementary school engaged in an afternoon of professional personal learning. Based on previous feedback from staff, the leadership team asked me to facilitate a workshop on teaching and learning with social media. 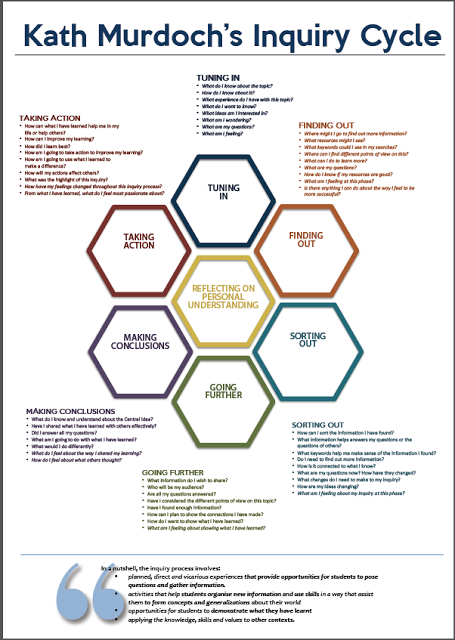 I used Kath Murdoch‘s Inquiry Cycle to plan the workshop and brainstormed with Christina to help refine it. I used Elena Aguilar’s Mind the Gap Framework to assist teachers in identifying their areas of success and growth (re: teaching & learning w/ social media). Teachers identified their areas of success and growth. We got started late and were pretty rushed in the 40 minutes we had and had to skip most of the Making Conclusions & Taking Action steps. I’m excited to have this new workshop framework for introducing teachers to social media and can’t wait to try it again! I was particularly intrigued by the discussion that the Think-Pair-Share lead to. It’s interesting to hear differing perspectives on what social media is, why we use it and how different media are used. What assumptions are (still) informing your perspective about social media (in education)? What have you done in the last 9 days to mind your gap? What will be/has been your first small step forward? If time was not an issue, how would you use social media in teaching and learning? What will you do this week to mind your gap? This month? This year? I’m not expecting responses but this gave me a chance to work on my questioning skills. I hope it gets them thinking as we head into the weekend! Tomorrow (afternoon of February 2) I’ll be facilitating a workshop for #AISQ8 (elementary) staff on using social media in teaching and learning. From my experience educators need to buy-in before spending (precious!) time learning and developing their social media presence. And that presence is essential if you want to genuinely use social media in teaching and learning. How can you help your students become connected if you aren’t? I would love your (my wonderful PLN) thoughts on some questions to (hopefully) help garner some buy-in from teachers. Feel free to discuss here, on Twitter, on my COETAIL blog or if submit here if you prefer to remain anonymous. Merci bien! Why have you chosen to use social media to create an open network and be professionally connected? What sparked your commitment? How did you become connected? What, specifically, did you do to cultivate your PLN? Why do you stay connected? What keeps you coming back to your PLN? How do you stay connected? How do you balance what you put in (time) with what you get out (benefits)? How do you balance creating your social media brand with staying authentically you (in a space where many people don’t actually know you personally)? How has being connected impacted your learning? Your teaching? Why have you chosen to use social media to create an open network for your classroom/students? What sparked your commitment? Why do you keep your classroom connected/open? What impact has this had on your students? What advice do you have for teachers who are looking to start using social media for teaching and learning? What ‘connected’ experiences have impacted you/your classroom the most? These personal stories can have a huge influence on other educators thinking about becoming connected. Sometimes I’m really dedicated to blogging. Sometimes I’m not. If I’m absent for an extended period of time it’s because I’m just too dang busy living life to sit and write about it. But there are some pretty great posts floating around in my head (and even written down somewhere!). 😉 In order to prompt me to actually sit down and blog, I need to be so excited about something that I just can’t help myself. After 5 months, today is the day! Thanks to the efforts and excitement of a lot of my colleagues, #AISQ8 has grown from 4 or 5 people to over 30 in the last year! If that isn’t something to get excited about, I don’t know what is. Besides sharing the great things happening in our school (we were inspired by #sisrocks), I have enjoyed engaging in discussion on a weekly basis ever since Christina and I started #AISQ8chat in February. Browse our 2014-15 topics, 2015-16 topics and all the archives. Starts Tuesday, 10/27, and will continue for the next 14 Tuesdays (except December 22 & 29). We will be releasing the questions each Sunday (although they will be the same each week, just with a different #IBOLPT). In week 1 we will explore why and how we, as stakeholders in the school community, live the #IBOLPT. We will spend 1 week on each of the IBOLPT starting with Risk-Takers next week. After exploring 6 traits, the week before (12/15) and after (1/5) winter break we will take time to reflect and make some conclusions. Our last chat (2/9) will focus on hiring staff who live (professionally & personally) the IBOLP. During our Tuesday slow chats we usually release Q1 by 8am, Q2 at 11am and Q3 by 2pm (just in time for our faculty meetings!). However you are welcome to reply to any question at any point throughout the day. Christina will be Storifying #AISQ8chat every Wednesday morning. Didn’t have a chance to engage in the conversation on Tuesday? We still want to hear from you! Feel free to answer any of the previous week’s Qs from Wednesday to Monday. Please just remember to include #AISQ8chat. You can also add #AISQ8unchat if you’d like. A couple days ago I was mentioned by Ryan and wasn’t really sure what was going on. Upon reading his blog post, I was quite flattered. It’s not every day that your peers, especially those you haven’t met, make you feel valued. Thanks for the shout out Ryan! Scott Mcleod & Jayson Richardson: I’ve said it before and I’ll say it again – attending NESA in Bangkok in 2013 was a game changer for me. Scott and Jayson introduced me to the School Tech Leadership program at the University of Kentucky…and the rest is history. No but seriously – I graduated earlier this month with my M.Ed. and would have never found out about the program had I not attended their 4-hour workshop in 2013. Throughout the course of the program I also got to work closer (online) with Scott and Jayson which was a privilege. Everyone else I met at Learning 2.014 Africa…guess it was a pretty powerful experience! Doug Johnson: I missed Doug’s sessions at NESA 2013 and was pretty bummed. However in September in Ethiopia, I made up for it. Not only was I able to attend his sessions, I was able to enjoy some drinks and a taxi ride to the airport with him. Every conversation with Doug is a quality one and I quite enjoyed finally meeting him after years of reading & commenting on the Blue Skunk blog. Marcello Mongardi: When I met Marcello at Learning 2 (and learned how to pronounce his name) I had seen his face on many a COETAILCast. But it was the Oman GAFE Summit where I really got to know him. He’s got great ideas, is laid back and a ton of fun. He was also a very accommodating chauffeur 🙂 When Jeff and I returned to Oman at the end of April for my 30th birthday celebration, we bonded further with Marcello and Sam over Indian food and red wine. I love it when “stranger friends” become real friends! In the spirit of social media educator friendships, this summer it is time to recognise your most supportive colleagues in a simple blogpost shout-out. Whatever your reason, these 5 educators should be your 5 go-to people in times of challenge and critique, or for verification and support. 1.You cannot knowingly include someone you work with in real life. 3.You will need to copy and paste the title of this blogpost and the Rules and What To Do information into your own blog post. There are 5 to-dos if you would like to nominate your own list of colleagues. 1.Within 7 days of being nominated by somebody else, identify colleagues you regularly go to for support and challenge. They have now been challenged and should act as participants in the #TwitteratiChallenge. 3.The educator nominated should record a video of themselves (using Periscope?) in continuous footage and announce their acceptance of the challenge, followed by a pouring of your (chosen) drink over a glass of ice. 4.Then the drink is to be lifted with a ‘cheers’ before the participant nominates their five other educators to participate in the challenge. 5.The educator that is now (newly) nominated, has 7 days to compose their own #TwitteratiChallenge blogpost and identify who their top 5 go-to educators are. This is why I love when teachers embrace social media and allow their classrooms to interact with the world. Yes we’re on the same campus. Yes I could have walked down to Abby‘s classroom. But I never would have been able to have these conversations with the students. Gives me chills. As my MEd with UKSTL winds down, I’m disappointed in my lack of reflecting on this blog. At it’s core, my blog is a place for me to reflect on my learning and practice. Unfortunately I’ve realized that a full-time job and Masters at the same time leaves little time for writing. Or I haven’t made the time. My goal is to start putting things on ‘paper’ that have been swimming around in my head for the last year. Starting today! Our #MACUL15 session just ended and I wanted to blog about it while I was still giddy from the experience. Minutes after the session had ended several attendees had already started reaching out to other educators around the world to connect their classrooms. That’s powerful. When we can inspire educators to think outside their norm, realize the power of globally connecting their classroom and take immediate action…I get butterflies inside just thinking about it! Connecting your classroom has a positive effect on student learning. It’s simple – you don’t need a lot of advanced techy gadgets. Plan with the other teacher in advance. Prepare your students for different cultural norms & to ask quality questions. There are lots of places to start connecting. Below is our slide deck. We provide links to help educators start immediately (where to start). Check out the Google Form and responses from educators around the world – we’re trying to make it as easy as possible to help classrooms around the world become connected.